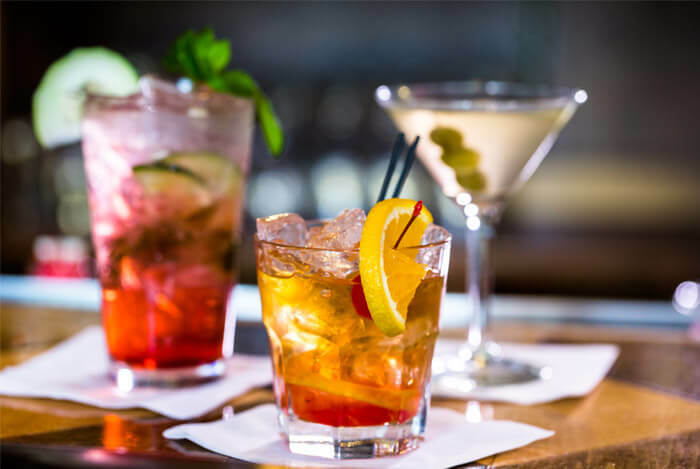 We’re all aware of the effects of alcohol on our health; drinking in excess is going to cause serious health problems such as cancer, heart disease, and cirrhosis of the liver – just to name a few. But a glass of red wine here and there is good for you, right? And it pairs so perfectly with a Mediterranean diet inspired meal. Unfortunately, red wine isn’t as necessary as some people would have you believe. 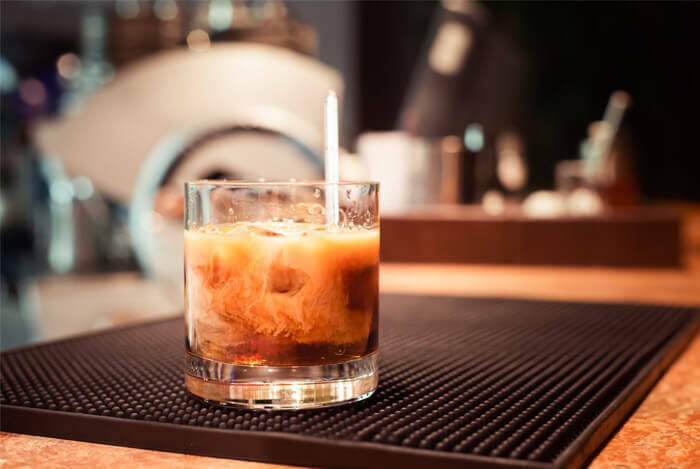 So now that we’re all admitting to having a drink every now again (I’m raising my hand), let’s start talking about how to make smarter choices at the bar. Thanks to websites such as Get Drunk, Not Fat, we have the power to truly analyze what’s going down when it’s bottom’s up. Let’s get this out of the way: I’m not telling you that the alcohol mentioned in this post is healthy. No alcohol is a healthy alcohol; alcohol is not healthy. I’ll need you to nod your head so I know you understand me. All kidding aside, there’s zero nutritional value in alcohol. You’ll find no healthy protein, no complex carbs, and no essential fats in alcohol. But you will find calories. Lots of them. Now, I’m not not one for obsessively counting calories, but I like my calories to be justified. For example, if I’m eating two eggs for 140 calories, I’m also gaining 12 g of protein and all the other amazing benefits that go along with eating super healthy eggs. 140 calories of alcohol will give me… nothing. You can argue that drinks such as wine, cider, or beer at least come from whole foods such as grapes and apples. But let’s be honest here, how much of that actual fruit and fiber is present in your sugary beverage? For most people, it’s hard to justify those calories on a frequent basis. And even though these drinks may be “healthier”, it doesn’t give you free reign to drink five of them under the guise of good nutrition. Remember: you’ll get the fewest calories, sugars, and health risks from the fewest drinks. And always make sure you’re drinking a glass of water in between each drink you consume. This will help ensure you’re processing your drinks at a safe pace. 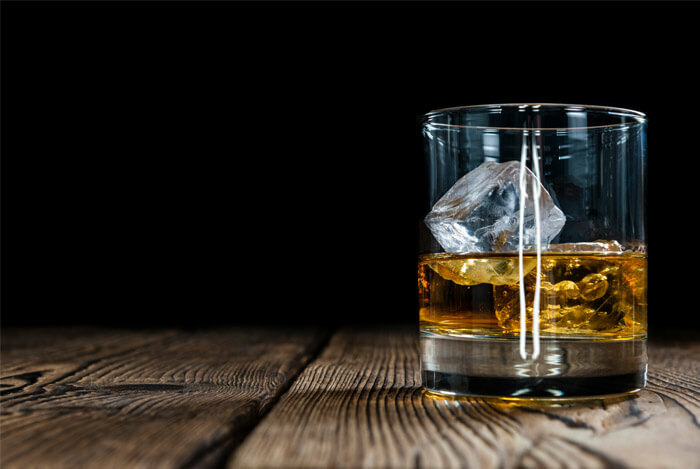 So now that we’ve cleared that up, let’s talk about the worst alcoholic drinks for your body and the best ones that work with your healthy lifestyle. Hard alcohol has the fewest calories, so you would expect those beverages to be the ‘healthiest’ for you. 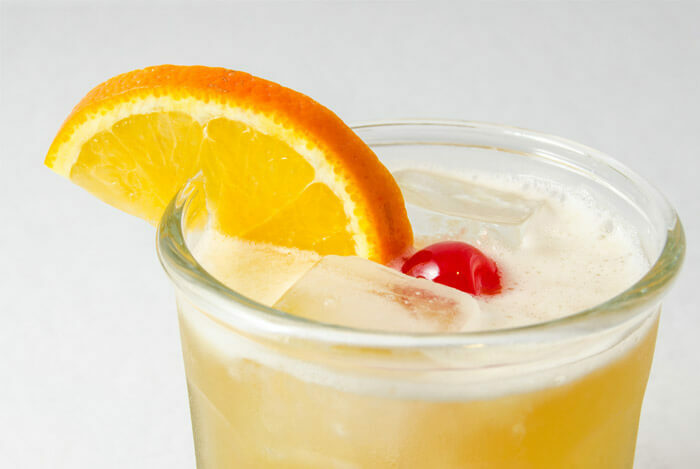 However, the real secret troublemaker at the bar is the mixers -aka, what ingredients go in a cocktail that make it something other than just alcohol – and they’ll easily become your downfall if you’re not careful. The majority of excess calories calories in drinks come not from alcohol, but from the juices, mixes, and soda that people add to them. Tonic water: 83 calories and 22 g of sugar. Most people are surprised to learn that fruit juice isn’t that healthy and contains extremely high amounts of sugar. One of these may have more than 300 calories due to the commercially made sour mix. On top of that, it’s also loaded with sugar to the tune of 57 g per drink. No, you did not read that wrong. These drinks are larger than most cocktails, at a staggering 12 oz. or larger, so you’re already drinking more alcohol and sugar than you should be accounting for. Now do you see why these sometimes clock in around 529 calories? Daiquiris are a prime example of what happens when you mess with a good thing. 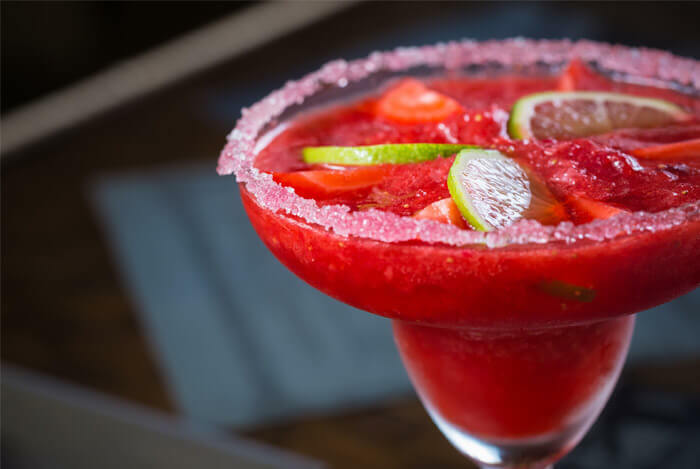 A traditional daiquiri calls for rum, lime juice, and a dash of simple syrup chilled and served in a cocktail glass. Easy and delicious, right? But many bars think this is too complicated, so they buy ready-to-drink mixes and keep them in a spinning blending machine that churns out a HFCS-laden monster slush. Those frozen single-serve daiquiri pouches at the grocery store are 280 calories and 36 g of sugar each! Frozen Margaritas or Pina Coladas at the bar can pack anywhere from 240–417 calories per drink. This category may be obvious to most people, but it’s worth having an explanation so you don’t get trapped by their tasty allure. Similarly, watch out for anything labeled as Irish cream as you’ll not only need to budget room in your diet for the sugar content, but also for the fat. A single shot glass-sized serving of this small after-dinner libation will set you back 147 calories, 9 g of sugar, and 6 g of fat. 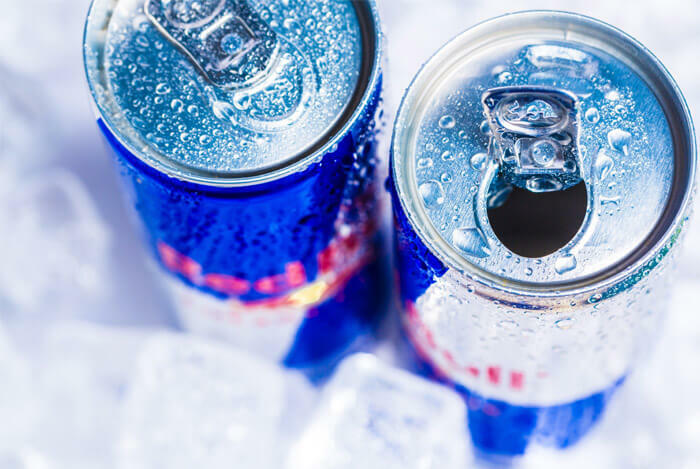 Though vodka Redbulls may have gotten you through college, they can be extremely high in calories. 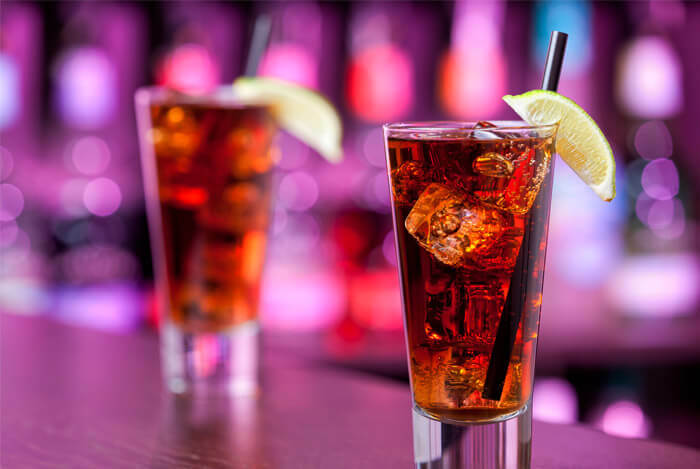 According to one study, drinking alcohol mixed with an energy drink is worse for you than drinking alcohol alone because the energy drink amplifies all of the alcohol’s effects. So there it is; the worst news is over. Now let’s get to those ‘healthier’ drinks I promised earlier. 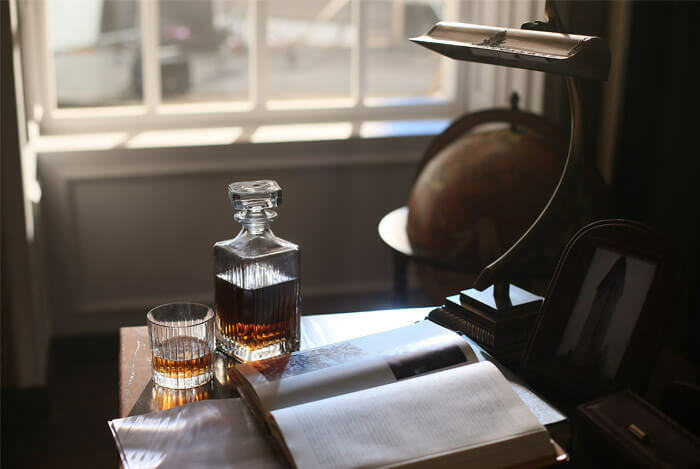 Since we’ve been talking about hard alcohol for most of this article, I feel like we should also discuss some of its more redeeming qualities to make up for all the negative (though well-deserved) attention. You can enjoy a ‘healthy’ cocktail with hard alcohol; some would even argue it’s the healthiest way to drink after all. If you want the drink with the fewest possible calories and sugar at the bar, ask for your liquor with one of these adjectives. “Neat” means your bartender will pour just your alcohol of choice in a glass and serve it to you as is. 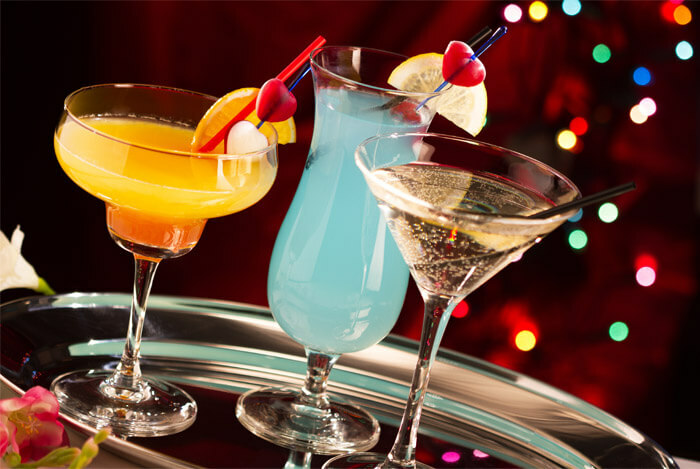 Ordering a drink “up” will result in a chilled serving of your alcohol selection. And a drink “on the rocks” will be your of choice of alcohol over ice. Now asking for these drinks may be straight up gutsy, so heed caution. Your alcohol won’t have any sweet mixers to tame the flame of high proofed alcohols. In other words: prepare to feel the buzz sooner, especially since most hard alcohol is around 40% alcohol by volume. But hang on a second. Unlike shots, neat and up drinks are meant to be sipped on. Think: slowly savoring an expensive whiskey or scotch with your pinky out. This extra time will allow your body to process the alcohol at a much safer rate. Plus, you won’t have to deal with sugary fruit juice, high fructose corn syrup-laden mixers, or soda at all. The only calories and sugars you need to account for are what’s in the alcohol itself, which are surprisingly low compared to the calorie-rich cocktails we’ve been discussing. As you may have guessed, this drinks pulls no surprises; it’s just vodka and club soda (seltzer). 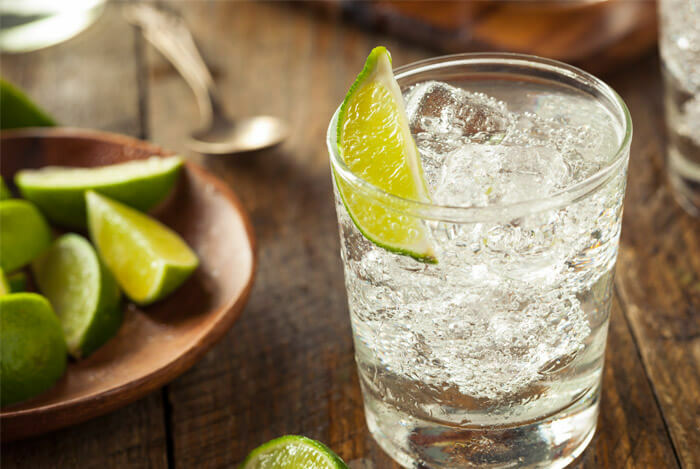 Club soda has zero calories, so the only calories you’re drinking come from your chosen vodka (around 96 calories). So if you’re thinking of kicking back with a cocktail after work at happy hour, make it a vodka and soda. If this is a bit too boring for you, you can add a lime, lemon, or orange wedge for some bright, citrusy flavor sans guilt. Plus, according to one study, your immune system becomes weakened “within just 20 minutes of ingesting alcohol” so having that bit of vitamin C will really help you. 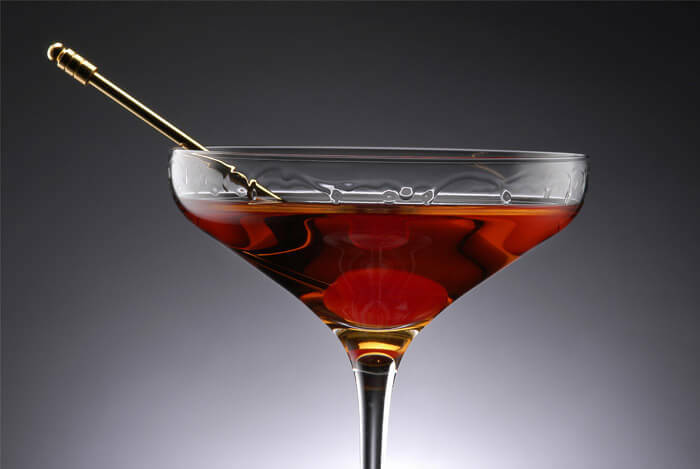 A surprisingly delicious drink, Manhattans are made with whiskey or bourbon, sweet vermouth, and Angostura bitters. This one’s well worth the 130 calories. Vermouth is a type of fortified wine that gets its flavor from marrying hard liquor and macerated herbs for a few weeks. Whiskey or bourbon is 40–50% ABV so you won’t need to drink many of these cocktails, either. If you’re not looking to get crazy, a glass of wine will help you unwind and become a bit more social. 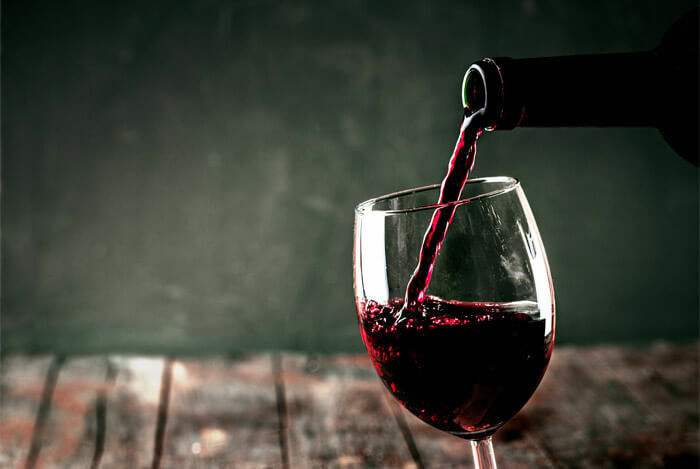 A glass of red wine will set you back about 120–150 calories. It’s about 14% ABV. White wine is a bit better coming in at 100–150 calories, but it typically has a lower ABV of 12.5%. There’s a common misconception that wine is high in sugar because it comes from fruit; however, the sugars are actually converted to alcohol during the fermentation process. Dessert wines break this rule as they are higher in sugar (hence, sweeter). 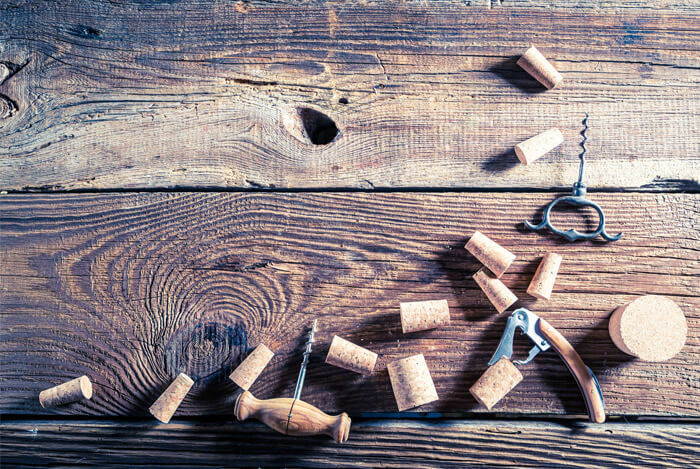 Even though most people consider wine to be the healthiest alcoholic beverage, scientific results haven’t been conclusive enough to prove these myths as facts. 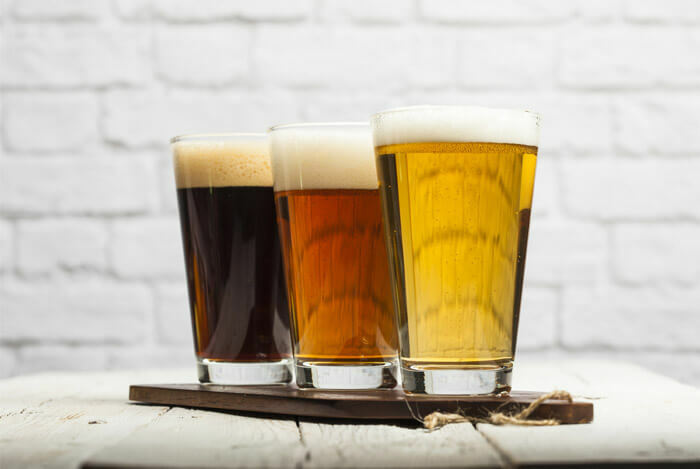 You have to be really careful with beer; depending on which beer you reach for, you could be sipping on 110 calories or 210. Big difference. Another downside: beer isn’t as high in alcohol by volume (4–5%), so in order to get the same kind of buzz you would with liquor, you need to drink a lot of it. And all of those extra beers means a lot of extra calories. I’m not one for calorie trackers, but ReThinking Drinking has an awesome tool on their website for visualizing liquid calories. You’ll find calories listed next to each cocktail and all you need to do is enter the number of beverages you drink during the week so it can calculate an overall calorie total. Seeing this number may help you identify one of the reasons you’re not losing weight. No matter which drinks you chose to imbibe, always make sure you do so in moderation. 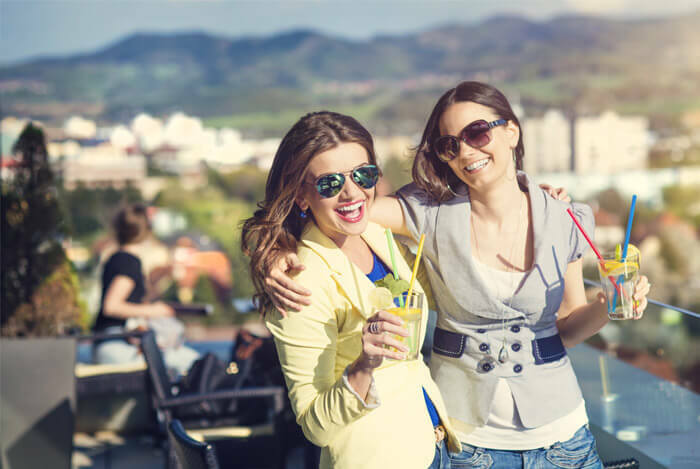 Any excessive drinking – even excessively drinking the healthier options we’ve discussed today – is still a surefire way to damage your health. What’s your take on alcoholic drinks? Have anything else you’d like to share? Let me know in the comments below!